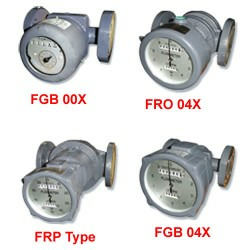 TOKICO FLOWMETER is a high accuracy displacement type flow meter composed of two roots and measures flow directly. There is little deterioration in the instrument accuracy because a couple of roots rotates with non-contact. This flow meter measures with high accuracy and wide flow range. Because the fluid is directly measure, the integration accuracy of this flow meter is within ±0.5% (The accuract within ±0.2 is also available according to the demands for a dealing and a tax certificate, etc.) Especially, because a pair of roots is non-contact, a light material can be adopted for the TOKICO FLOWMETER. And low viscosity fluids can be measured with high accuracy and wide flow range. Because the roots is adopted for the rotor, discharging fluid volume in one rotation of rotor is larger and the roots meter is designed small and light. Mechanical parts of the roots meter do not wear because of non-contact rotation and there is little change of instrument accuracy in a long time operation. Because the roots meter rotates without contact, the rotor is excellent in durability. The pressure loss is smaller than another displacement type flow meter because the rotors do not contact each other.